Like millions of other Americans, Colin Cagle viewed President Donald Trump’s first speech to a joint session of Congress on Feb. 28. Unlike most, the 13-year-old Odessa resident, attended Trump’s speech in Washington D.C. He was the invited guest of U.S. Rep. Gus Bilirakis. Colin Cagle, left, was an invited guest of Rep. Gus Bilirakis during President Donald Trump’s first speech to a joint session of Congress on Feb. 28 in Washington D.C. The 13-year old Odessa resident is in seventh grade at Martinez Middle School. That fact is even more impressive, considering each member of congress was allotted just one extra ticket for Trump’s address. Cagle, a seventh-grader at Martinez Middle School, was thrilled to receive the rare invitation. “I was just extremely thankful, and I was in shock. I was so surprised,” Cagle, said. 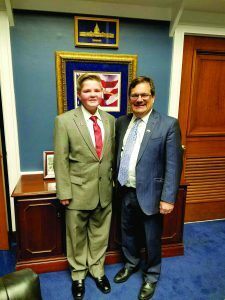 Cagle and Bilirakis have remained in touch, and the congressman became enthralled by the youth’s keen passion for politics. That was furthered once Bilirakis’ office came across a 6 ½-minute NBC News feature on Cagle’s political interests and ideology. Cagle, an unabashed Trump supporter, left the address content with the president’s remarks on strengthening the military and unifying the country. The teenager’s visit to Washington D.C. also included tours of the U.S. Capitol Building, the Kennedy Center and the Library of Congress. “It was really awesome,” he said. Though Cagle always has had an interest in politics, his curiosity peaked following the Feb. 2016 death of his 75-year-old grandfather, Lyndon Hooper. 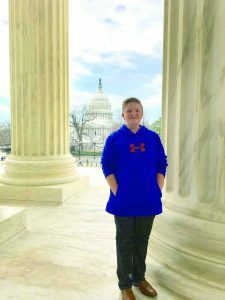 During his visit to Washington D.C., 13-year-old Colin Cagle received tours of the U.S. Capitol Building, the Kennedy Center and the Library of Congress. 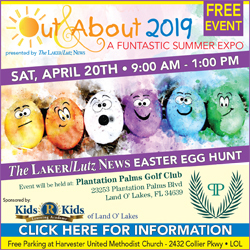 According to Cagle’s mother, Sharri, the youth’s grandfather was “extremely involved” in politics, assisting with numerous campaigns, including former Republican Congresswoman Katherine Harris. Following his grandfather’s death, Cagle closely monitored the 2016 presidential race, heavily researching the hot-button issues. Trump’s position on health care reform and immigration were two of many Cagle agreed with. “I kind of formed my own opinions, and they happened to match up with President Trump’s,” Cagle explained. He then put his conservative principles in action. Prior to the election of the 45th president, Cagle volunteered at Republican call centers in Carrollwood, Brandon and Orlando. He also attended three of President Trump’s campaign rallies in Tampa, Lakeland and Ocala. Being such an open Trump supporter has come with some challenges, however. Yet, he’s stood firm in his viewpoints. “I’m proud of him,” she said. “I think that’s important to stand with your convictions, and not waver when you believe in something, and not change who you are depending on who you’re with,” he said. Cagle said he hopes one day to make a difference in politics, perhaps as a senator or congressman. With plans to start a Young Republicans Club at Martinez Middle, his passion for government and politics doesn’t appear to be waning anytime soon. Meanwhile, the young conservative remains pleased with President Trump, less than two months in office.